Nearly 75% of the music industry revenue is from the online streaming. There are several subscription-based streaming platforms that allow you to listen to any music at any time. Unless you are in a no coverage area, you don’t need to download and store them on your smart devices. As smart speakers and smart home devices are increasing, the streaming services will increase its share in the music industry revenue. 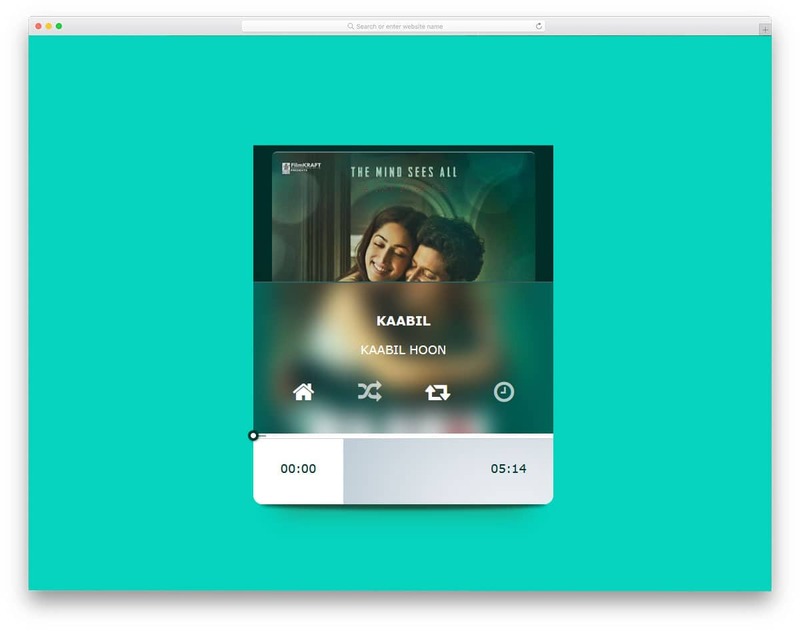 If you are planning to make a beautiful music player for your streaming website or mobile applications, these HTML music player design might give you some inspirations. Some of the HTML music players are practical and you can use them as such on your website or application. While some give you some crazy prototypes, which will help you make a unique looking website. As most of your online streaming users are going to spend their time with the music player, making it unique and keeping the options at easily to accessible positions is a must. 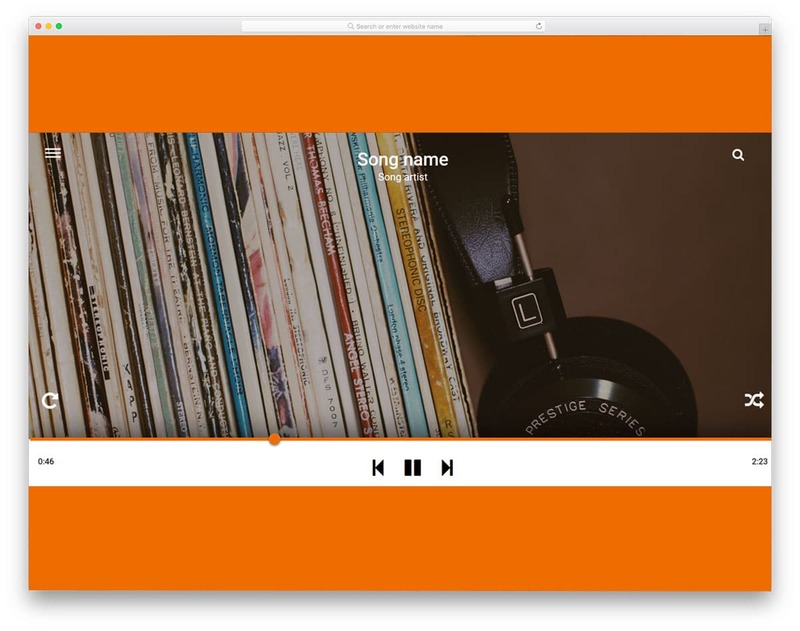 This HTML music player design collection will help you find your unique player. 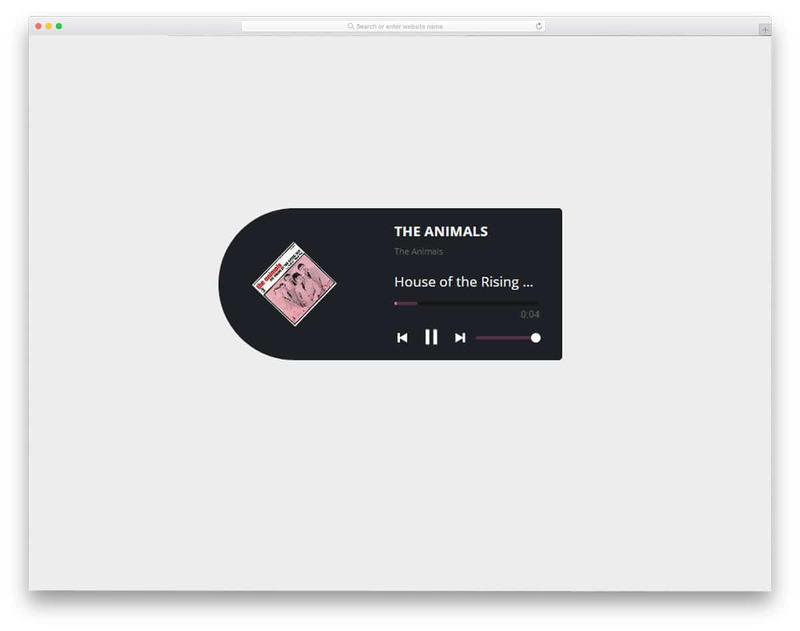 This is a minimal style music player design, which is fully functional. Just like the luxury car music systems, the album details and timeline pops up when you play the music. 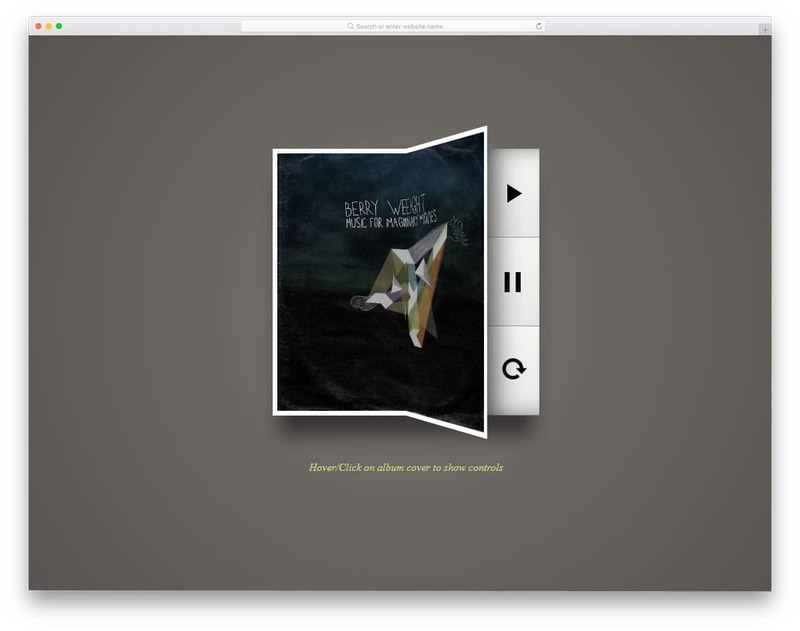 Since a full page design is shown in the demo, a blurry image of the album art is shown in the background. Disc plating like animation will remind the early 2000 music players. Shadow effect is used to clearly distinguish the music player from the background. The next, previous, and play/pause buttons are perfectly working in the demo itself. All you have to do is to take the code and modify it based on your needs, before using it on your project. Music Player 2.0 is a properly designed music player for mobile applications. The strong multi-tasking capability of the smartphones let the users enjoy the music on the go. Sometimes the default player won’t satisfy the user needs. If you are planning to make a mobile application for a music player, this design will give you some inspiration. It has a shuffle, repeat, and favorite options at the bottom for better accessibility. The only flaw with this design it the music stops every time you hit the next or previous button. But, it isn’t a big issue, you can fix it easily. As the developer of this music player has shared the code with you directly you can get a better hands-on experience before using it. For a better presentation, the developer has used iPhone design. Take a look at our iPhone mockup collection for the latest model iPhones. 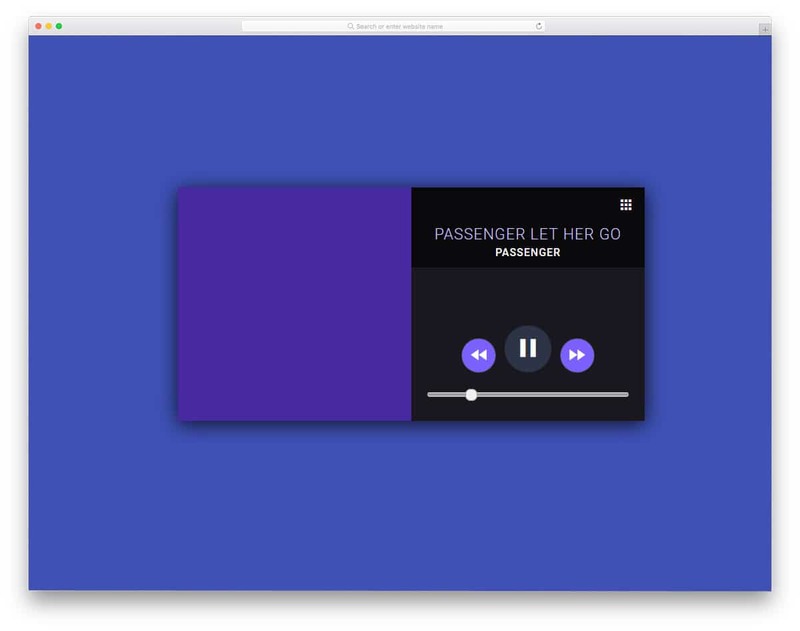 Player is a colorful music player design concept. This one is not completely functional like the music players mentioned above. The creator of this player has given you a basic structure of a modern music player. Transparent parts of the music players easily adapt to the background and the album arts. Shadow and depth effects are used to differentiate the control panel from the main player. Texts are made big enough so that the user can clearly see the texts on the music player. By adding a few text effects, you can make big titles fit in perfectly within the given space. On the top left corner, you have a hamburger menu icon to list all other options. If you are making a responsive music player, this design might help you. This is also a music player concept like the Player design mentioned above. It is designed purely using the HTML and CSS script alone. Animated audio bar will give a lively effect to the music player when it plays the music. The volume controls and equalizer settings are given on either side of the music player. 3D cube like animation makes the player look cool and also manages to put all the necessary options in one place without taking much space. Another advantage with this player all these lively animations is done purely using CSS3 and HTML5. So using it on your web application won’t be an issue. If you are planning to make a beautiful karaoke app, this Lyrics player might give you some design inspiration. As the name implies, you get the lyrics line shown on the music player. Fonts used for the text is bigger and bolder so the user can easily read the content on it. Plus, the currently playing phrases are highlighted using subtle text effects. It is a fully functional karaoke player so you can use it and see before using it on your application or website. Other than the lyrics effect, the music player has a basic design. 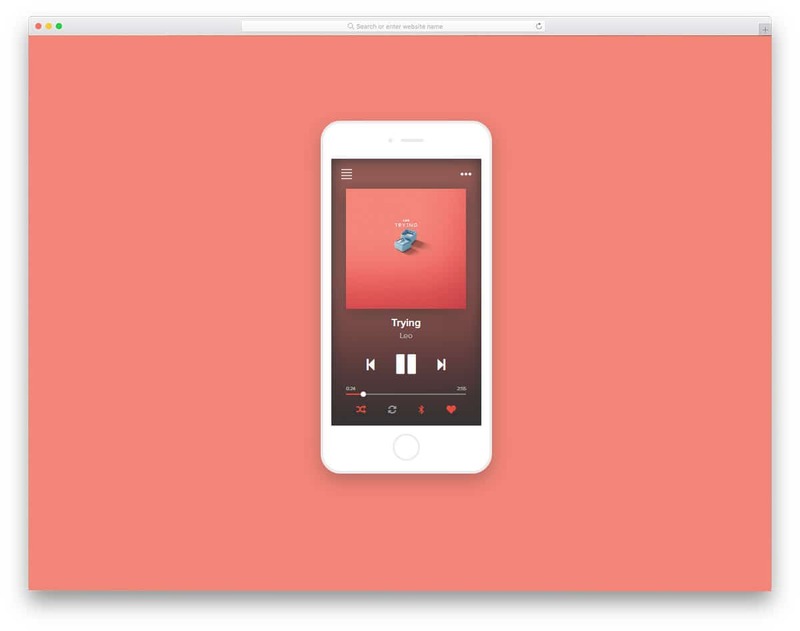 If you want, you can use other HTML music player design mentioned in this list to make your player look unique. 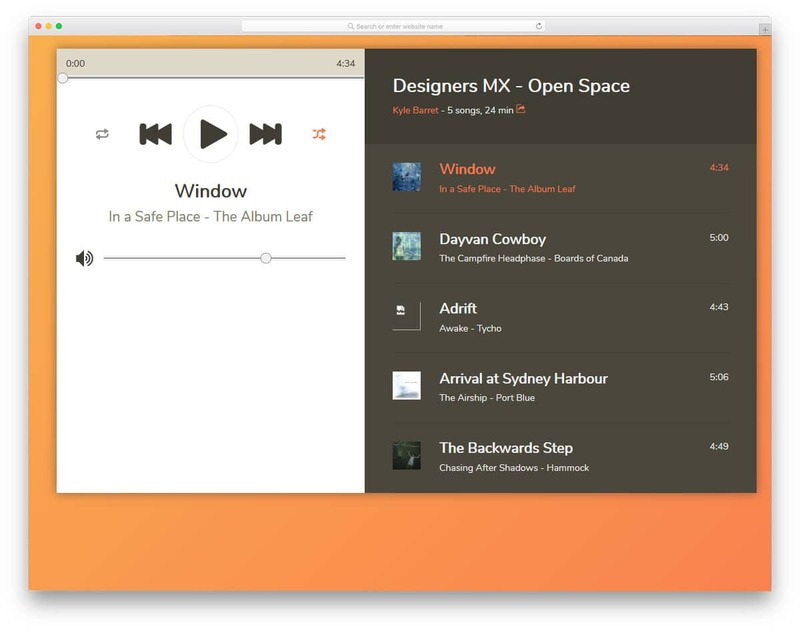 This is a simple yet elegant looking music player design. Though the default design lacks few controls, the concept is very interesting. The creator has used a gramophone-like icon instead of the play and pause button. An animation popup is used to show the play and pause message. If you are using audio contents as a part of your website, designs like this might make your website interesting. 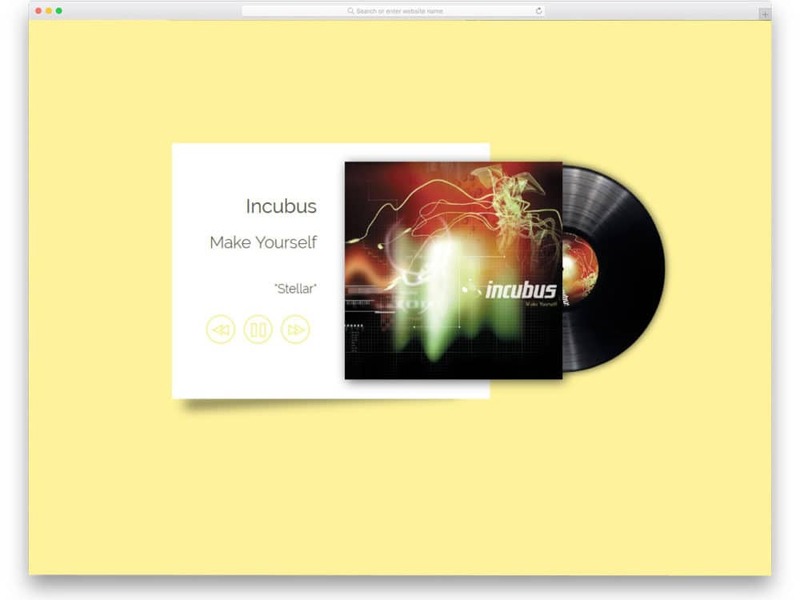 By making a few customizations this music player design can be used for proper public use. 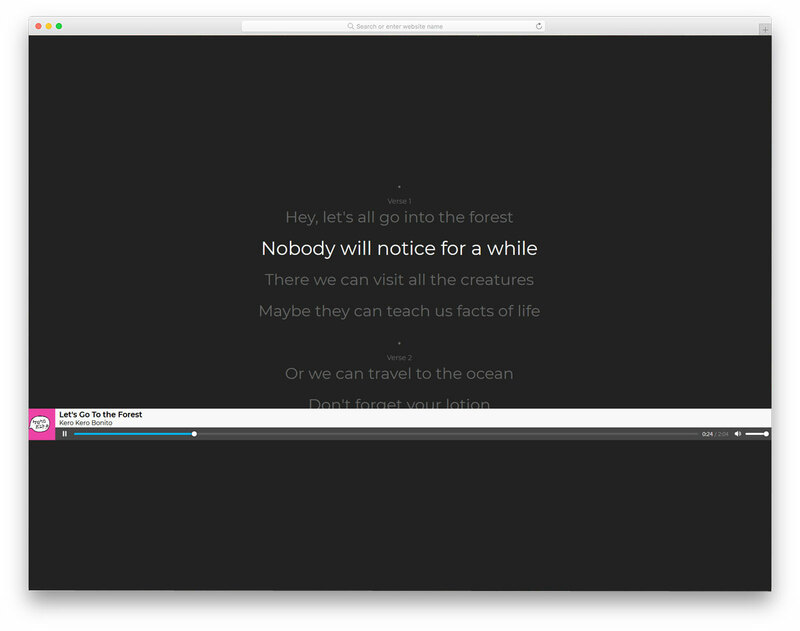 Entire code structure followed for this music player design is shared with you in the CodePen editor. Customize and see the results before using it on your website. Material Music Player is a cool looking colorful music player. From the name itself you can infer that this player uses a material design. Since this music player is originally designed for mobile phones, all the options are placed at the easily accessible positions. Icons are used to show the details about the song and control options. Volume control options are also given in the default design. With a single click, the user can see the entire upcoming song queue. A pink color scheme is followed for all the elements and options. You can use the color scheme you want. 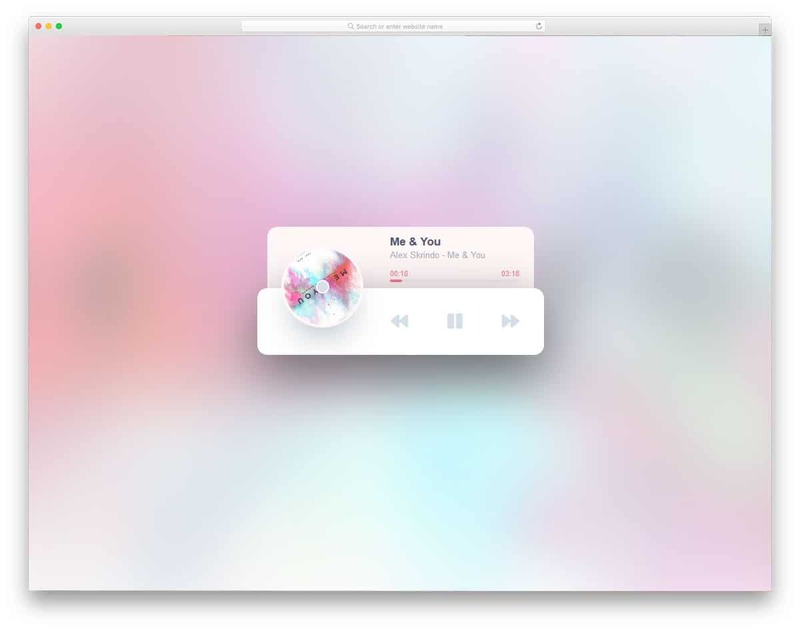 If you are looking for a music widget design, this might inspire you. Powerful processors let us do multiple tasks simultaneously. Hearing music in the middle of a tiresome workday is the best way to release the steam. Giving widget options or floating window options like this will let the users easily access the song. For example, the mini player option in the iTunes. 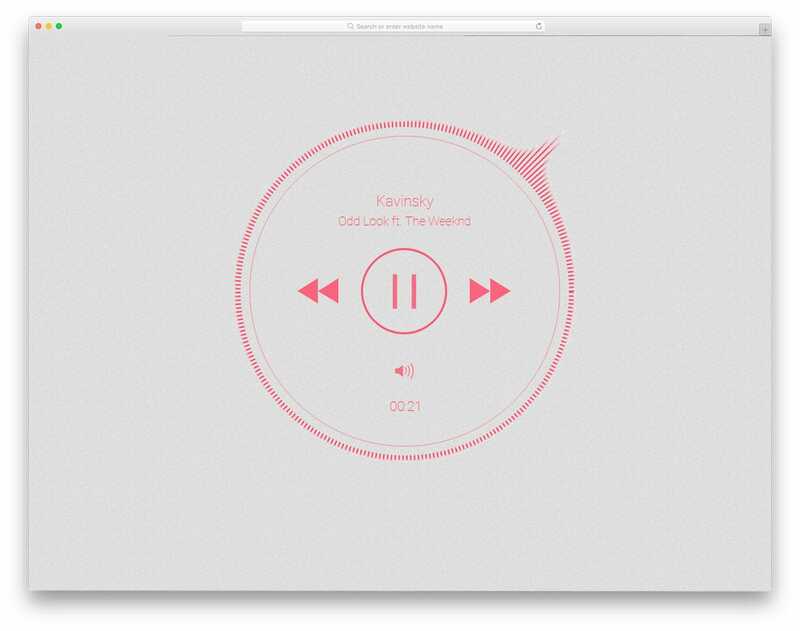 The creator of this music player has given you a circular design. Curves and sphere sectioning helps you add all the important options in one place. 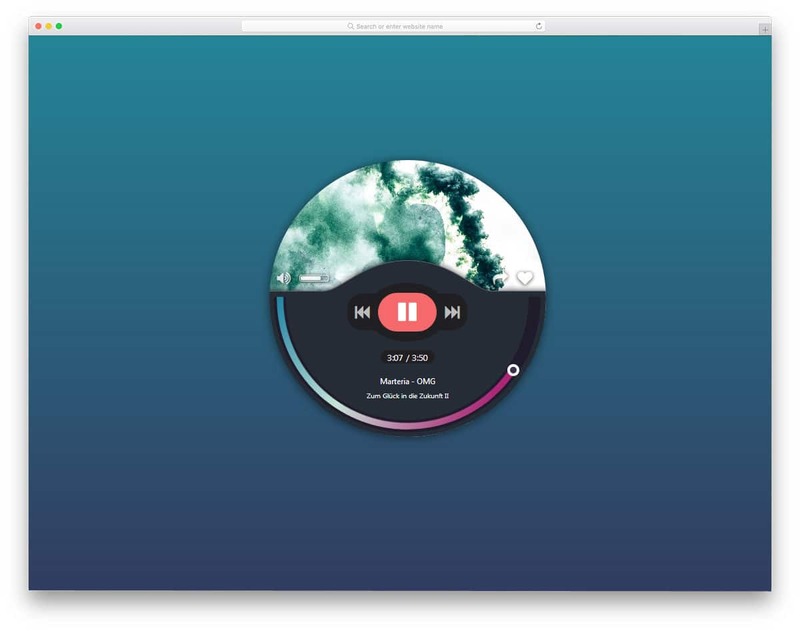 A gradient color scheme is used for the timeline, which looks beautiful on the circular music player. This is a light skin version of the Flat music player version mentioned above. This one is more responsive than the one Flat music player. If you are making a web application, this responsive design will come in handy. The animation effect on this music player is pretty bold. But, the effects are sleek and quick so the users don’t have to wait for the animation to complete. Mostyle hover effects are used to show the related options and labels. This is a concept design, so you don’t get a fully functional version in the demo. But still, you can use this code base to create your own custom music player. Music app – TweenMax is a design for a music community website. If you are planning to let the users interact with each other and discover the music loved by others, this design might help you reveal some bright ideas. The majority of the screen area is reserved for the visualizer. All the music player control options are added on the top right corner. On the visualizer area, the user also can see other members interested in that song. Website navigation options are added to the left sidebar and the music player options are added on the right sidebar. Take a look at our free dashboard template collection to manage your users easily. This is a simple and elegant looking music player. It is a fully functional music player, which you can use it in to play music the demo itself. Sensitive bars around the music players move dynamically when you start playing the music. Animation effects give a lively feel to the music player. Plus, the animation effects make the circular music player look more elegant. All the control options are given at the center. The only thing this music player misses is the space for album art. Apart from that, this music player has all the options to make a proper music player. Better Audio Player is a mini audio player which you can fit easily on any part of your website. If you are designing a music website, widgets like this will come in handy. 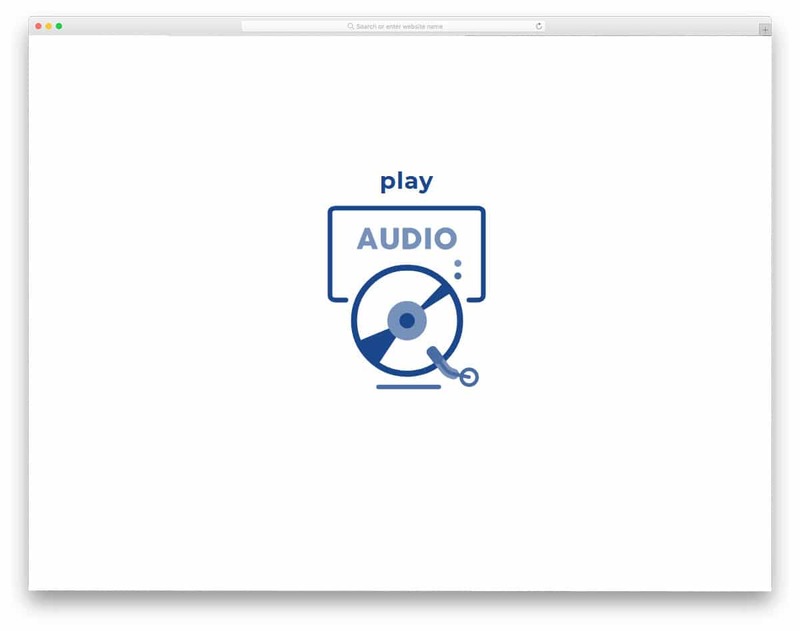 This audio player is designed using the HTML5 and CSS3 frameworks. So you can change the shape of the music player based on your design needs. Since it is a mini music player, you get only limited controls on the player. The album art on the left-hand side rotates to give a disc rotating effect. Basic music control options and volume options are also given. Based on your need you can add extra controls like shuffling options. The music player by Matt Stvartak can be used as the full version of the mini music player mentioned above. This one also has the disc rotating animation to show the album art. The disc goes inside the music cover or envelope when you pause the music. A single color scheme is followed throughout the player to maintain the design consistency. Shadow and depth effects are used to differentiate and show the elements. 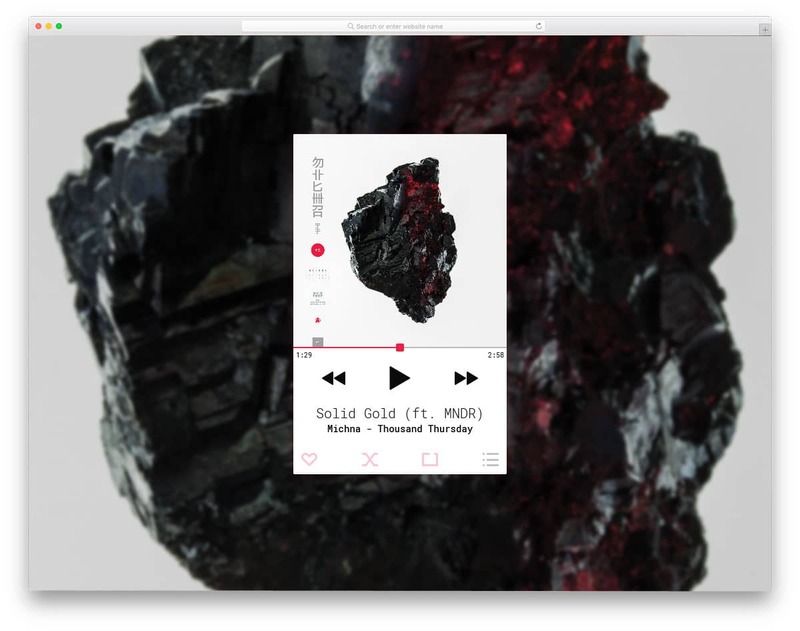 Most of the elements on this music player are designed using the HTML and CSS script. So you won’t be having any issue in using it on your website. Talking about envelopes, take a look at our envelope mockup collection for cards, letters, and discs like this. This one is another material music player with full of colors. In the previous version you have a single color theme, but in this one, you have multiple colors. For every next music, the background color of the music player changes. 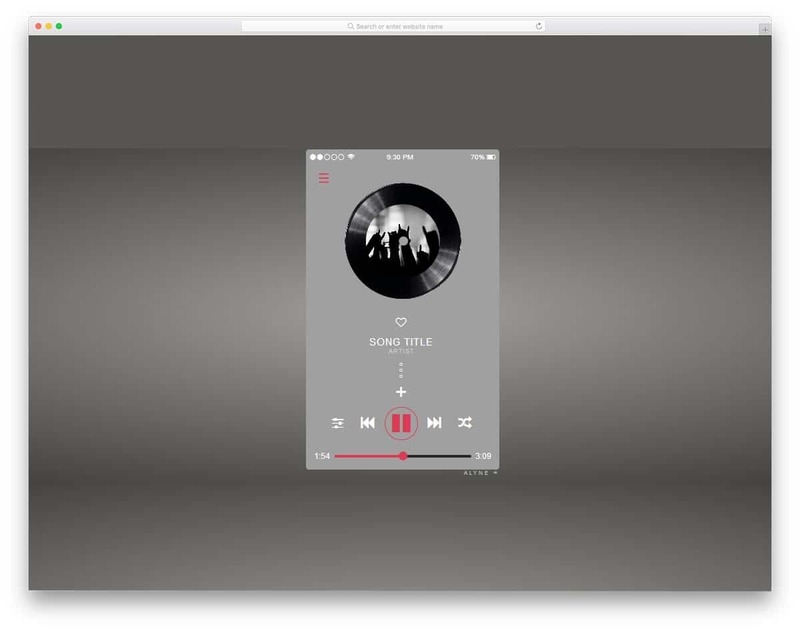 Split screen design is followed in this music player. On the left, you have space to add album art and to the right, you have all the music control options. Transition effects are fluid and smooth so that the music player easily adapts to the screen. By making a few customizations, this music player can be used for both mobile applications and website widgets. 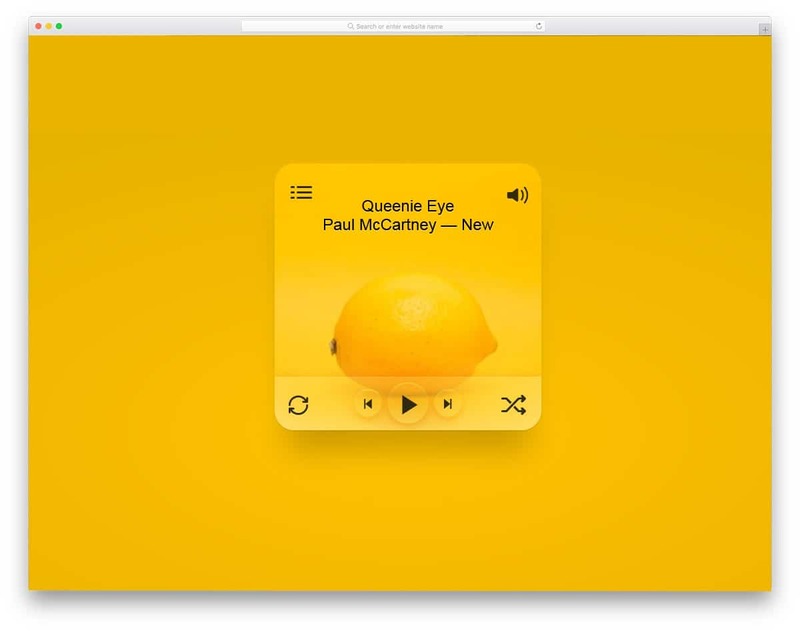 Music player with hidden controls is a responsive music player design. As the name implies all the options are hidden behind the album art. This unique design makes it limited only for the desktop version. On the mobile version, you need to tweak the design a bit for better user experience. The page flipping animation is smooth and clean, thanks to the SCSS framework. Basic music control options like play, pause, and loop mode options are given. Shadow and depth effects are used to give a floating appearance to the music player. By making a few customizations you can add the features you want. Mini Music Player is another fully functional website. All the options given on the demo are fully functional so you can get a basic idea before using it on your website or application. A transparent design is followed in this player, which gives a glass-like finish. However, it still needs a few adjustments to make it a proper music player. 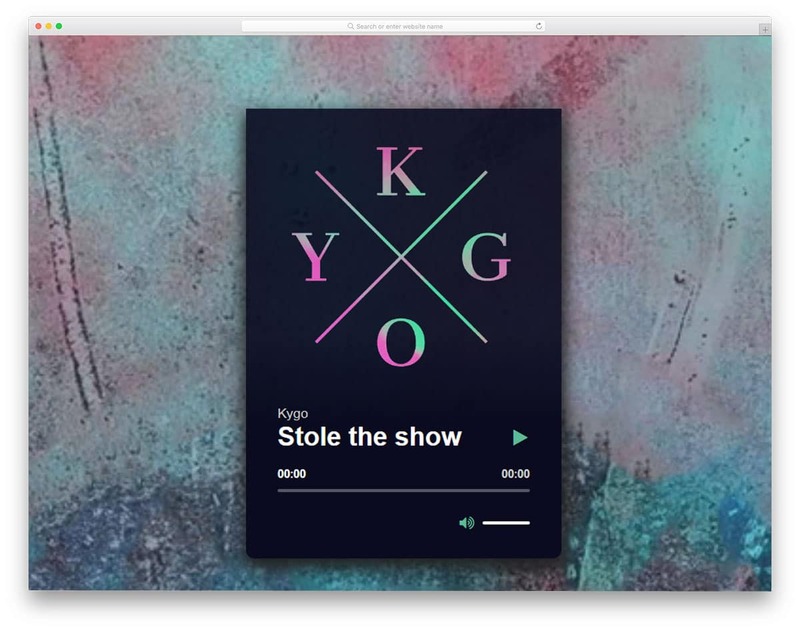 The entire code structure used to make this mini music player is shared with you. You can use this code as a base to create your own custom player with the options you want. 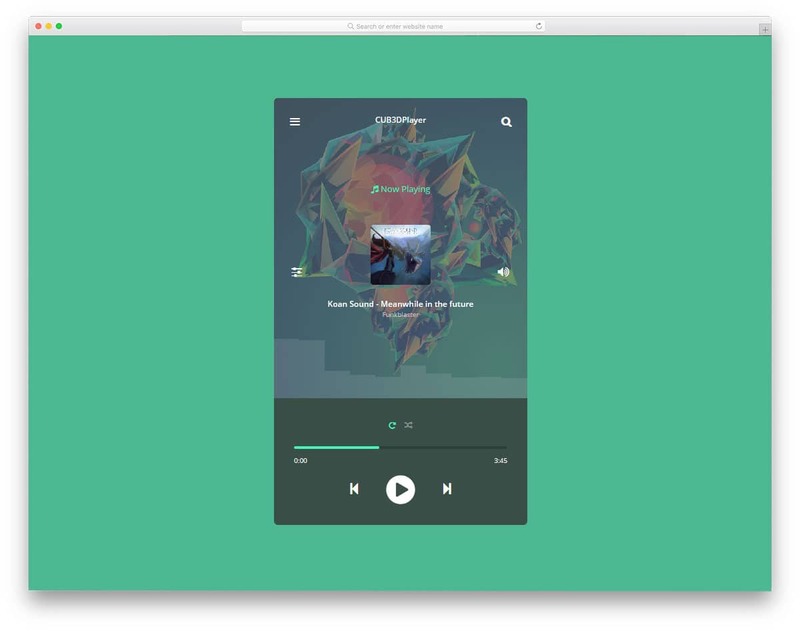 This music player is a desktop version of the google play music player. You get the same bold icons and orange color scheme. The minimal design shows only the important information so that the player won’t look clouded. Still, the design given in this example is a base design. You have to manually work on it to make the player fully functional. There is a lot of room for improvement in this design and you can fill it with your creativity. The code scripts used to make this player is given to you directly. So you can have a better hands-on experience before using it on your project or design. Abbey Music Player is another functional mobile music player. The design might jog some people’s memory about their Xperia mobile devices. Neat simple yet functional design with all the options placed at the most accessible positions. 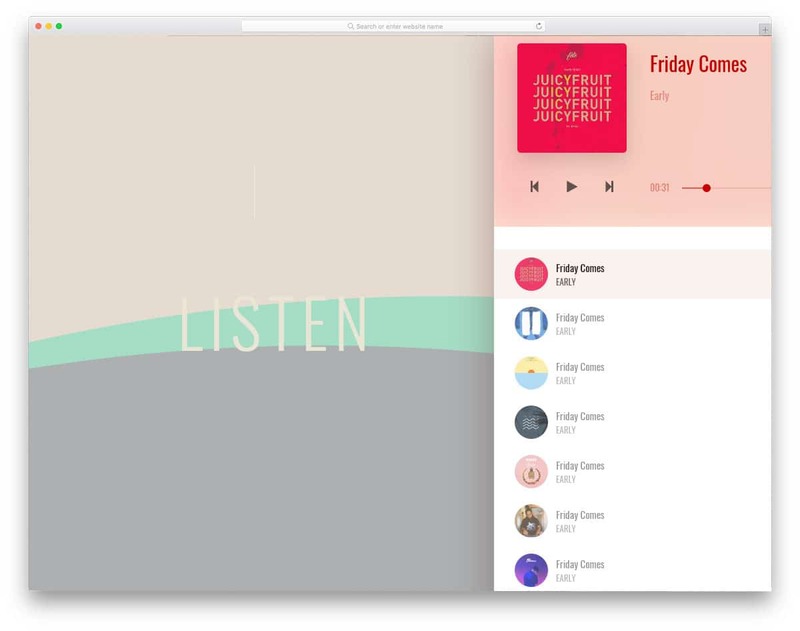 The creator of this music player has given you a basic design. You have to manually work on the back-end functionalities. All the music control options are placed behind the hamburger icon. A small bug in the default player is the music plays only when you hover over the album art. This might be something you need to fix before using it. Other than that all the other features are properly designed. Music Player UI is another concept design. This music player let the user see the complete album list on one side and music controls on the other side. Icons and the texts are made bigger so that the user can easily see the contents on the screen. Plus, the split screen design gives you an ample amount of space to add related controls and options. Again, this is a concept model so you can use it as an inspiration. By making a few adjustments to the code you can use this music player as a widget on your website or as a mobile application.